Nick Ford, Economist, ATB Financial - From newspapers to TV screens, there's been heavy coverage of Albera's current and future economic landscape. Politicians, hournalists and economists have all weighed in but how do Albertans feel about the current state of the economy? ATB Financial asked this question and others to gauge consumer sentiment in its brand new bi-weekly Ear to the Ground poll. Despite news of oil's price struggles and a weakened loonie, 45% of the survey respondents view the current Alberta economy as strong with 27% of respondents perceiving our economy as weak. There are sings of worry amongst Albertans however. Over a third of Albertans anticipate that the economy will be weaker six months from now compared to about a quarter who believe it will be stronger. Click here to read more about the Albertans keeping calm and moving on. From newspapers to TV screens, there’s been heavy coverage of Alberta’s current and future economic landscape. Politicians, journalists and economists have all weighed in but how do Albertans feel about the current state of the economy? ATB Financial asked this question and others to gauge consumer sentiment in its brand new bi-weekly Ear to the Ground poll. Despite news of oil’s price struggles and a weakened loonie, 45 per cent of the survey respondents view the current Alberta economy as strong with 27 per cent of respondents perceiving our economy as weak. There are signs of worry amongst Albertans however. Over a third of Albertans anticipate that the economy will be weaker six months from now compared to about a quarter who believe it will be stronger. Additionally, close to 40 per cent of Albertans express intent to delay major purchases such as a house or car. And, 45 per cent are reconsidering travel plans. 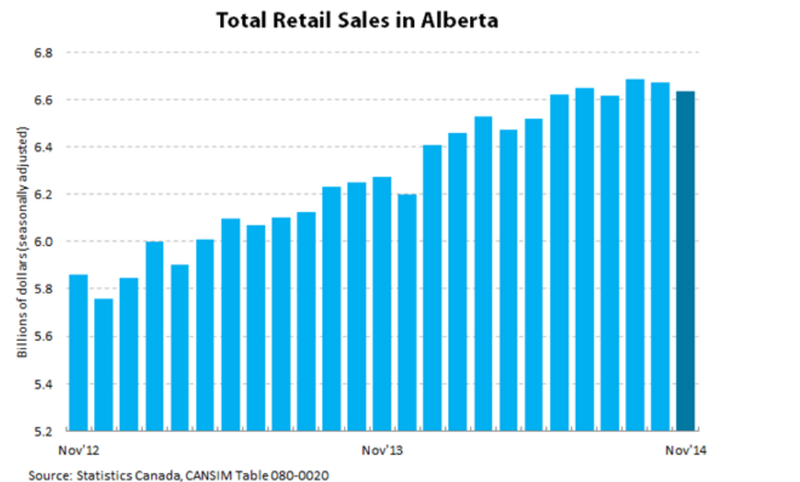 In general, Albertans are waiting for the dust to settle before deciding to make any large-scale purchases. This is likely tied to market uncertainty and the concern the economy might weaken in the next six months. In general, Albertans are relatively optimistic about our economy. The latest retail sales numbers indicate that spending is still well above where it was two years ago (see chart below). For now, Albertans will continue to trudge through the flurry of economic news stories. ATB Financial’s most recent forecast projects that Alberta’s economy will grow by two per cent in 2015.